Robert Rawdin is one of the men named on the Bottesford ‘church list’ of WW1 servicemen, and is remembered on the Methodist Roll of Honour in Bottesford. He was the second of seven sons of Thomas and Sarah Rawdin of Bottesford, five of whom served in WW1, following in the footsteps of the oldest, also Thomas Rawdin, who served in the Boer War and won distinction in a heroic action earning him the epithet “The Hero of Nitral’s Nek”. In WW1, Robert, William, Frank, Harry and Frederick Rawdin all joined the army and rose to be sergeants. Moreover, the family can claim the rare distinction that five of the six men, including the Boer War veteran, rose to the rank of sergeant. Robert Rawdin was born in 1874 in Bottesford. His parents were Thomas Rawdin, born in 1848 in Bottesford, and Sarah Ann Lilley, born in 1851 also from Bottesford. See Appendix 1 for further information. In 1881, Thomas Rawdin worked as a bricklayer and labourer and the Rawdins lived at 1 The Green, Bottesford. However, at the time of the census, seven years old Robert was recorded as a ‘visitor’ at the home of Mr and Mrs William Sutton at 46 High Street Bottesford. By the time of the 1891 census, he was working as a clerk in Melton Mowbray, lodging with the Fairbrother family in Melbourne Street Melton Mowbray. Then by 1901 he had moved further afield, working as a solicitor’s clerk in Settle, North Yorkshire and lodged with Mrs Eleanor Hardacre, a widow aged 67, in Duke Street, Settle. Robert Rawdin married Cecily Hook in Settle in 1909, and in 1911 they were living at 4, High Hill Grove, Settle, with a cousin, Frances Ann Crosby, aged 48, a Postmaster’s Assistant. Robert was still employed as a solicitor’s clerk. Robert and Cecily had a daughter Mary Josephine who was born on the 30th July, 1910, and another named Christina Margaret on the 24th December, 1912. Sadly, Mary Josephine died in 1919. Many service records were destroyed in WW2. Some of Robert Rawdin’s service pension records have survived but sadly not all. He was a member of the Territorial Force from the 13th March, 1905, to the 5th August, 1914, a period during which he enlisted with the 6th Battalion West Riding Regiment in Settle on the 21st May, 1908. Following the outbreak of war, he served as a Sergeant in the 6th Battalion Duke of Wellington’s West Riding Regiment, Service Number 744, in France. 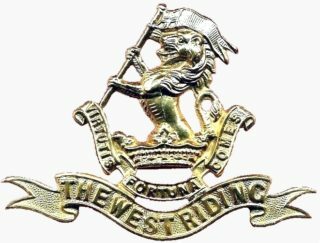 The 6th Battalion became part of the 147th (2nd West Riding) Brigade in the 49th (West Riding) Division. He was later posted to the 298 Battalion Labour Corps, as a Sergeant with Service Number 205639. The 298th Battalion was part of the Northern Command Labour Centre, Labour Corps, based in Strensall York from May 1917, until January 1918 when it moved to Ripon. 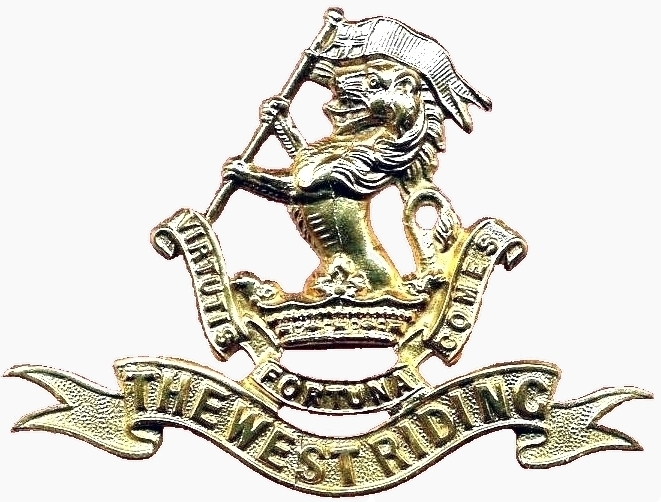 The 6th Battalion West Riding Regiment saw action in 1915 in The Battle of Aubers Ridge and the defence against the first phosgene attack at Wieltje north-east of Ypres in Belgian Flanders. It may be that this adversely affected his health, as Robert was back in the UK by 2nd June, 1916. He was discharged from the army on the 24th January, 1918, aged 44. The Medical board in Ripon considered him as “no longer physically fit for active service”. Though difficult to read, the medical reports relating to his pension records suggest that he suffered from a heart problem that was deemed to be “constitutional”, originating before his enlistment in Settle but aggravated by his war service. In another report it refers to a heart wound. Again it is unclear as to whether this arose from active service. In another document it describes him as previously wounded but gives no details. His grade on discharge was IV. His disability was deemed to be permanent and he was classified as 20% disabled, which continued through the annual medical board reviews following his discharge. Robert Rawdin was described as “of good character, trustworthy, honest, sober, and intelligent and a hard working soldier”. He was awarded the 1915-Star, The Victory Medal and the British War medal. He also had a Silver War Badge. Robert continued to live in Settle with his wife Cecily (sometimes called Cecilia). They moved from High Hill Grove to West View, Settle, in 1922. He died in Settle in June 1930 aged 56. In his death registration his name was recorded as Robert J. Rawdin . His obituary stated that he was of a quiet and retiring disposition and had many friends. He was fond of all sport and his chief recreations had recently been fishing and shooting. He was survived by his wife and daughter. Robert Rawdin’s wife died in 1938 aged 65, her name recorded as Cecilia, not Cecily. Harry, who became Quarter Master Sergeant in the Royal Fusiliers and other regiments. Frank, who was a sergeant in the Notts. and Derby Regiment the Sherwood Foresters. Frederick Cecil, who was a sergeant in the Royal Fusiliers. Another son, William Henry Rawdin, served as a Private in the Army Cyclists Corps.